Stephen Miller: Another fakester from Donald Trump’s army of liars. America’s Liar-in-Chief, Donald John Trump, dispatched one of his other liars to the Sunday news talk shows this weekend, leading The Washington Post’s fact-checking service to issue “bushels of Pinocchio’s to Stephen Miller’s usual vote fraud false claim that, itself, is fraud. 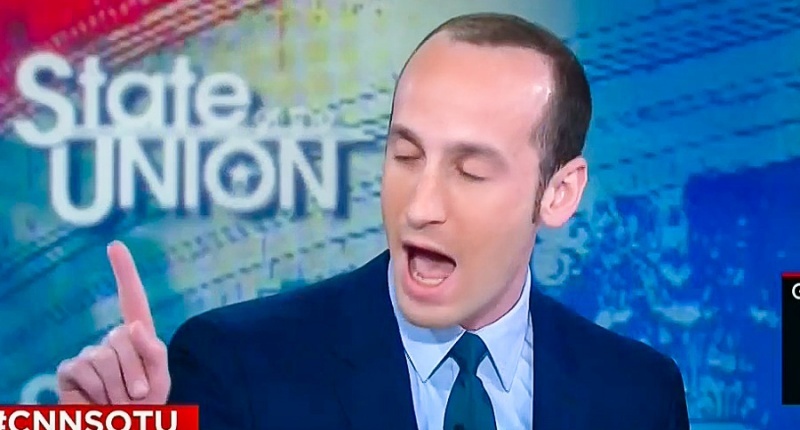 Miller, the 31-year-old right-wing fanatic credited with crafting the now court-banned travel and Muslim bans disguised as an “executive order,” never met a lie he can’t tell or repeat over and over. White House senior policy adviser Stephen Miller appeared on ABC’s “The Week” on Sunday, spouting a bunch of false talking points on alleged voter fraud. (He also repeated similar claims on other Sunday talk shows.) To his credit, host George Stephanopoulus repeatedly challenged Miller, noting that he had provided no evidence to support his claims. But Miller charged ahead, using the word “fact” three times in a vain effort to bolster his position. I can tell you this, voter fraud is a serious problem in this country. You have millions of people who are registered in two states or who are dead who are registered to vote. And you have 14 percent of noncitizens, according to academic research, at a minimum, are registered to vote, which is an astonishing statistic. We found millions of out of date registration records due to people moving or dying, but found no evidence that voter fraud resulted. Trump, Miller and other aides misrepresent an Old Dominion study by professors from 2008 and 2010 even though updates to that study refute the the claims of the President’s administration. Jesse Richmond, one of the researchers who wrote the Old Dominion study that Trump and Miller cite as “proof” that 14 percent of noncitizens are registered to vote in the United States, says the report does not say that. Researchers who make their livings locating data that shows, nof fantasy but fact is a lost concept in the Trump White House and among the lemmings on the Republican side of Congress who genuflect to the madman from Trump Tower. The facts show that Stephen Miller, like Donald Trump, is another damn liar in this disaster of a Presidential administration. This is a President with no evidence of moral or ethical underpinnings that has surrounded himself with people and staff with the very same traits. It’s no wonder he’s getting such a shoddy representation of talent in his White House. Who with a shred of morality or ethics would want to tarnish their reputation by being part of it? The growing evidence mounts daily that Trump is indeed an egomaniacal mentally unhinged lunatic who is clearly a very real danger to the country if not the world.